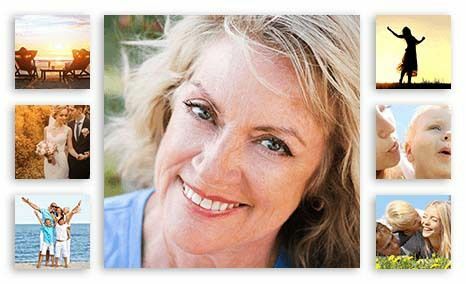 Whether your loved one is coasting through ageing like they've done it all before or stumbling along on the brink of a mid-life crisis, turning 50 is a milestone that simply must be celebrated. These 50th birthday presents will help bring the fun back into 50. Reflect on the joy of years gone by or prepare for the excitement of tomorrow. Shine a spotlight on love, family, travel and everyday beauty with a photo gift that will capture all that has been and all that will be. Bye bye crisis, hello good fortune. Make her 50th birthday party come alive with a photo board of magical memories. 50 deserves more than a collection of photos cut and pasted onto a DIY photo board. 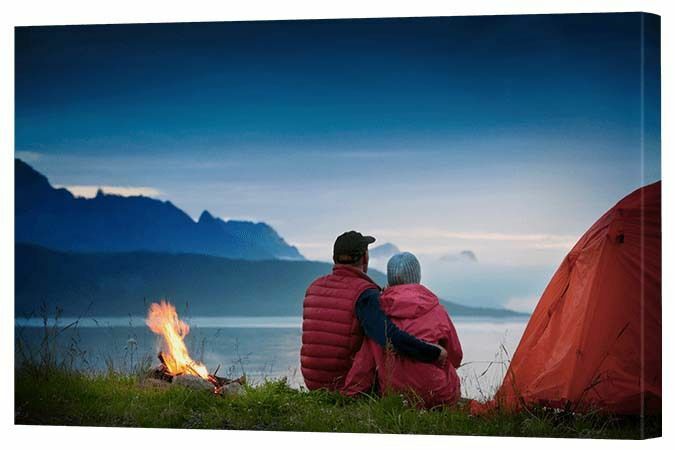 Do DIY with a difference with a stunning canvas wall display instead. Make it a decorative feature for her party then, once the celebrations are over, find a special spot in her home where it can be mounted and enjoyed into the future. If the 50 year old in your life has a green thumb or simply a love of flowers, then color her world with her favorite bloom. Breathe new life into an ageing home with a gift of flowers - the kind that live on and on. Nothing brightens the interior of a home more than a fresh, colorful bouquet and now you can gift that special woman in your life with a split image design that will delight her more than you can imagine. The key to getting this gift 100% right is to know her favorite flower. 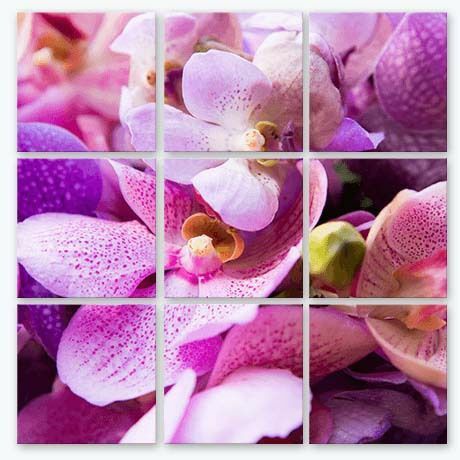 If you know this then search our Canvas Art to find the best flower to suit. If she's a gardener, you can take this present to a whole new level by personalizing it with a photographic print straight from her garden. Gear up macro on your camera and get up close and personal with the flower, capturing each exquisite detail. Awesome 50th birthday gifts for men can be tough to find, but this bucket list on metal will inspire a new lease of life. Channel his mid-life crisis into a well constructed list of activities he's always talked of doing but never has. 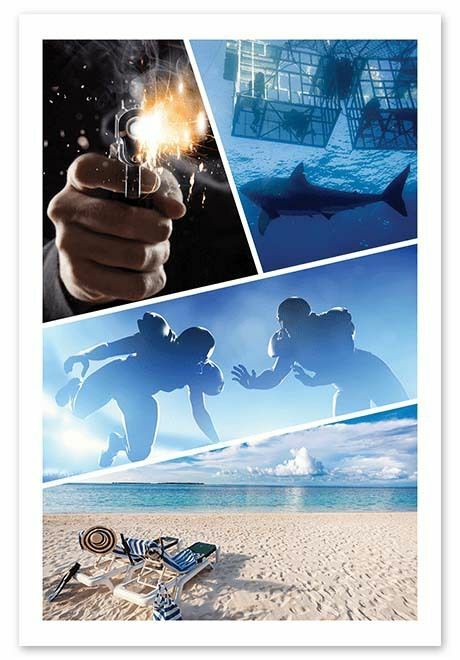 Perhaps he's always wanted to swim with the sharks, fire a gun, go to the Super Bowl or simply relax on the beach in the Maldives. Whatever his cup of tea, capture it on a canvas collage! This modish metal design is a captivating, contemporary way to display a photographic collection of all the items that sit on his list of things to do. In fact, for this gift you don't even have to guess. In the lead up to the big day, start sneaky conversations to find out more about what he wants to do with the rest of his life. The beaut thing about this gift is you don't have to fork out an exhorbitant amount of money fulfilling his every wish - this is more about inspiring him to start taking steps to fulfil his dreams. Printing on metal means it will become a stand out piece he will have no hesitation hanging in his man cave, workshop or pool room. Getting old doesn't have to mean getting boring, so have a bit of fun gifting this creative, playful survival kit. The key to preparing a survival kit is to combine both useful and completely useless items - as long as they're all relevant. Balloon - To start your birthday off with a ‘bang’. Wrapped Canvas - Wishing a birthday ‘wrapped’ in happiness. Watch - Hope you enjoy every ‘minute’. Marbles - To replace the ones you’ve already lost. For the single canvas print, be sure to use the happiest photo you can find of your friend or family member. Nothing wipes years off a person than a smile. Turn back time by capturing travel memories packed together on a classy canvas collage. Surprise your partner for their 50th with a collage that pays tribute to all the wonderful holidays you've enjoyed side by side. Take a break from the Facebook merry-go-round and display your time together on canvas rather than computer. Beach and sunset photos looks spectacular on canvas, glass and metal materials so if the seaside has been your adventure of choice, you're in good stead. But there's no need to limit yourself. Urban and country landscapes on canvas will also make those good times live on. 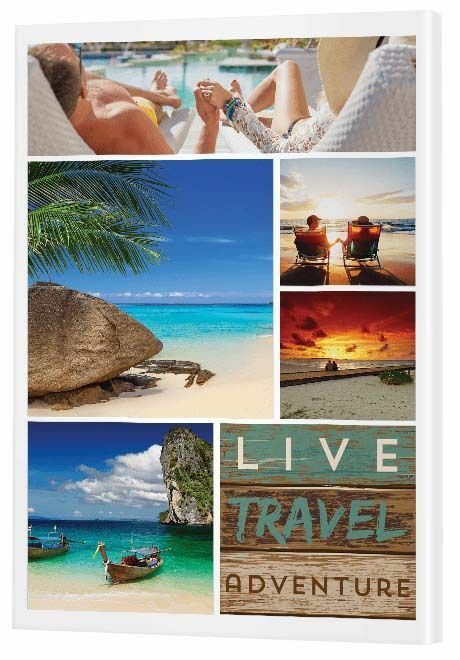 And if you're keen to personalize your collage rather than utilizing this themed 'live travel adventure' piece, check out our Traditional Collage designs then add your own choice of travel quote as a graphic. For inspiration google 'travel quotes' then use Canva to create your own customized quote using whatever text, color and font you like. That said, if you prefer to keep it simple this themed travel canvas is a great way to create a wonderful work of art in no time at all. There's something about printing on glass that turns it into instant art with all the elegance of high end interior design. 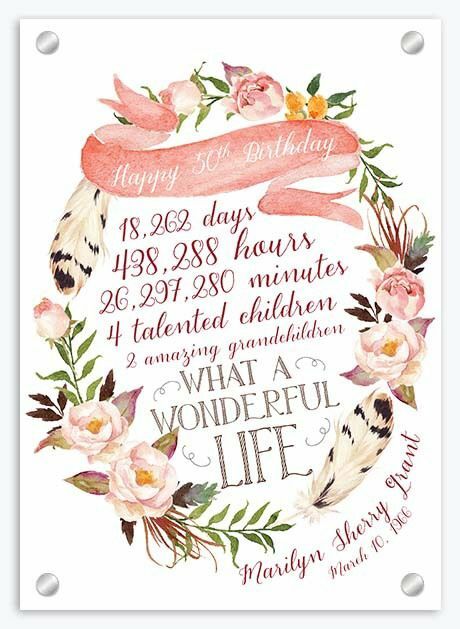 Make an impact with a 50th birthday print that honors every day, hour and minute of life as well as the major milestones. The wonderful bonus about this gift is how affordable it is. This is a simple single canvas and can be printed as small as 8"x12" (20x30cm) and as large as 36"x54" (90x135cm). This is not an off the shelf product. To create this one-of-a-kind image, you have to do the hard yards and put it together yourself. If you're not great with graphic design, ask a friend or family member to put it together for you. Alternatively, if you're savvy with Adobe Photoshop or Canva, you can recreate this or create something similar by choosing a floral border from a photo library like iStockphoto then writing your own text in the center area. Sounds harder than it is, but the result (and the smile on his or her face) is well worth the effort. There are many cats to come, but this heart collage offers an opportunity to paws ... er ... we mean pause. There's no shame in being the cat lady (or the cat man for that matter! ), so help her celebrate the furry friends from yesterday and today with a gift of cats. 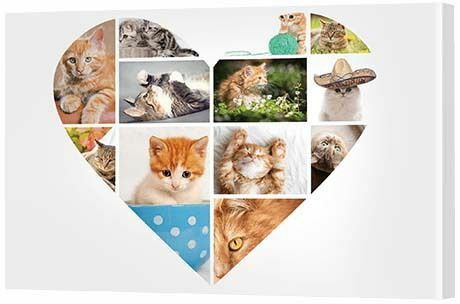 This heart collage is the perfect display, indicating the love that each and every cat brought. Gather together photographs of all her four legged friends from past and present. Simply ask for copies of them or perform a bit of cat burglary of your own. It will all make sense in the end! How purrrfect will it be to see all her furries immortalized on canvas? 50 is a milestone that is worth remembering, so prepare something special for the big day then capture it on canvas. While memories are never as good as the experience itself, they can come pretty close! Capture that special birthday occasion on camera and print it onto a traditional collage canvas, a superb template that lets the photos speak for themselves. Hire a professional photographer for the day or delegate the job to a talented family member. The key is to capture the magnificence of the event and all the happy expressions of those participating. 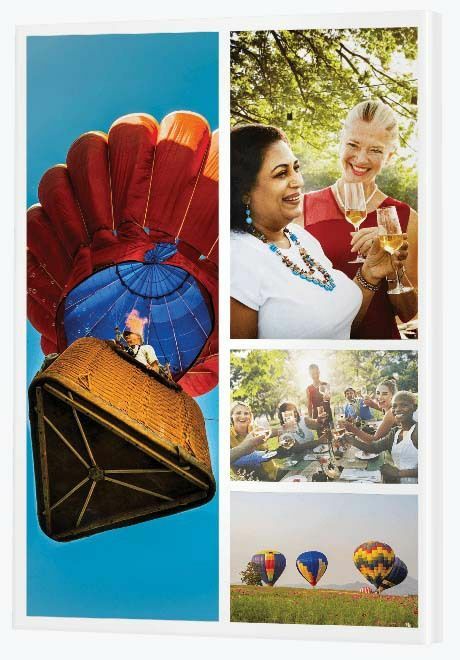 If it's something as magical as a champagne breakfast and hot air balloon ride, you'll be able to create a picture perfect collage that will hang pride of place in the recipient's home. For a personal touch, consider using one of the panels to add a special message. Using Canva, you can create an image featuring any text you want in any color you choose. Should you do this, consider finding a collage that features more frames. Either way, the result will be a stunning series of precious memories that will continue to delight for years to come. Stuck on finding the right gift for the man who has everything and, if he doesn't, prefers to buy it himself? He's fussy and everyone knows it which makes every birthday more painful than the next. If you're racking your brain for 50th birthday gift ideas for men and don't seem to be making any progress, just think metal. A single metal print, a split image metal print, a metal wall display, a metal collage - metal is every man's friend. Metal turns any seemingly sentimental gift into a something suitably masculine. To create metal art, add a collage of black and white photos. Stylish isn't it? To give it a fun 50th theme, add a personalized quote. Brazen isn't it? This gift won't bring a tear to his eye, but it will tug at his man strings. He'll sigh with relief to know he's received something he didn't even know he wanted. Everyone's a winner with metal. For the lover of all things nautical go glass. For the lover of art, go split image glass. 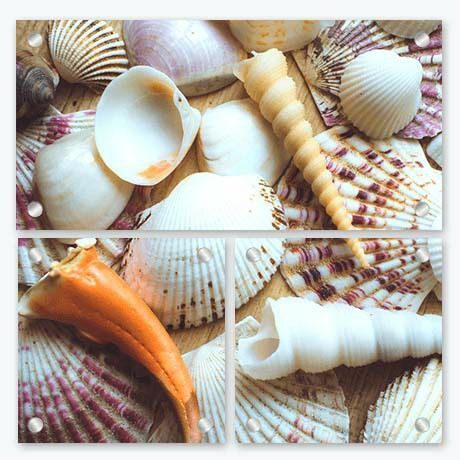 Glass provides a cool, fresh, stylish material for photo printing which is why it's perfect for any seaside inspired print. The most simple picture is instantly transformed into art when printing on glass. Add a split image effect, like this three frame design, and you will have a work of art that will give a family home or holiday home a makeover. To create this impressive piece, search for 'shells' in the Canvas Art section and make someone's 50th birthday full of style. In your day, canvas prints weren't even a thing, but they are now so surprise her with a stunning wall display. You have a beautiful old album of wedding photos and even a few rickety old framed photos hanging around the home, but nothing as spectacular as what can be achieved today. Dust off and scan in the best memories from that special day and print them on a canvas wall display. This display features four simple square frames you can fill with love. 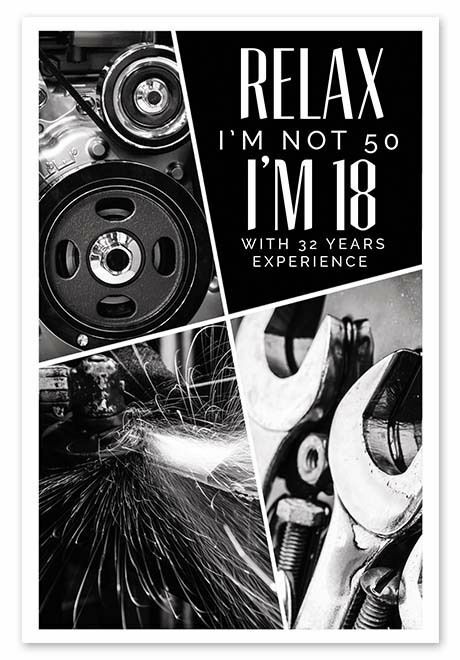 She won't know what hit her when you present this to her on her 50th birthday. She will fall in love all over again - just like you do each and every day. Just count your blessings you stuck with classic fashions!